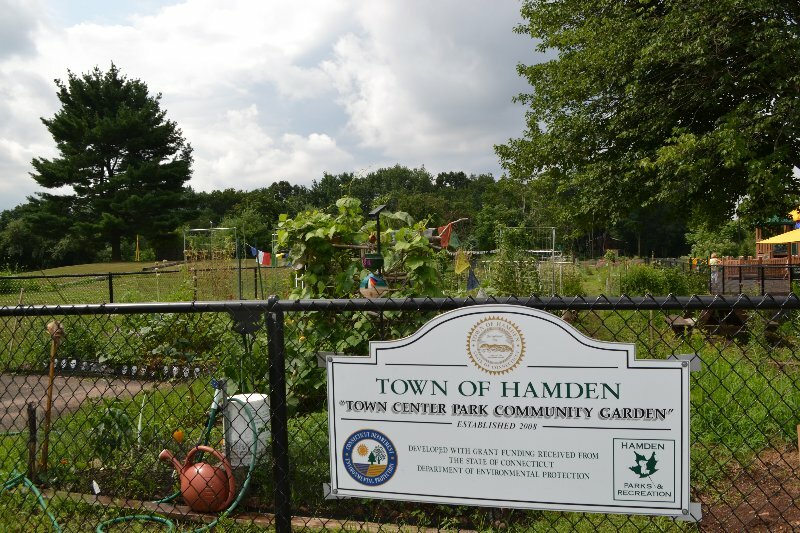 Hamden, CT is where I grew up and lived until I went away to college. There have been a lot of changes in town since I was a kid. 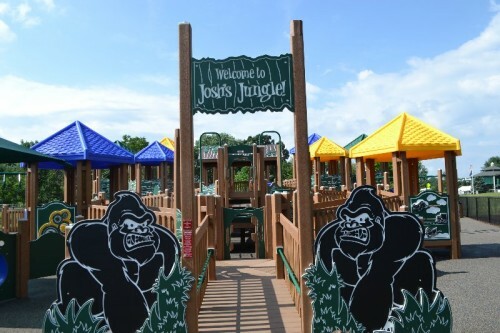 One of the newest additions is Josh’s Jungle playground in the center of town. It is an all-abilities playground that was carefully designed to accommodate children who use wheelchairs. 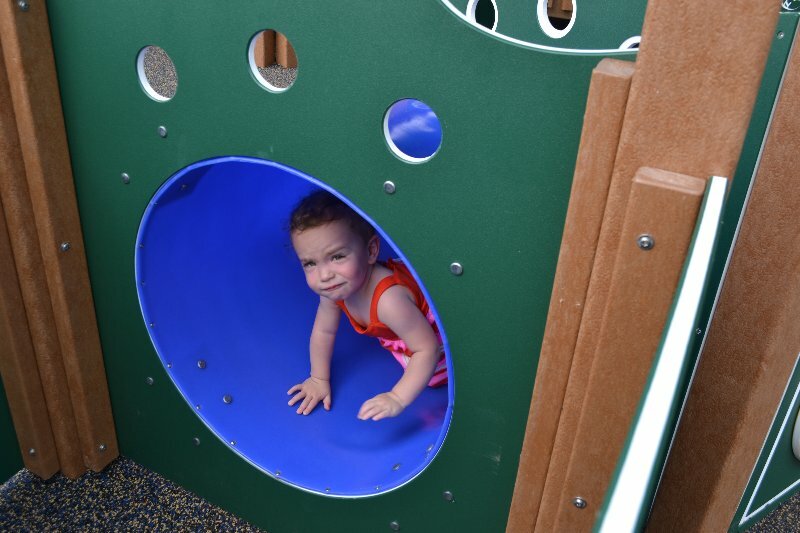 Jennifer Tramontano had the idea for the park after she had become frustrated with the lack of local playgrounds that were available for her wheelchair-bound son, Josh. 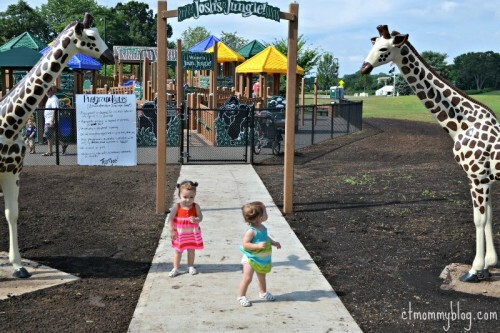 Ten years later and her dream for an all-inclusive park has finally come true. Josh’s Jungle gives children with disabilities and their peers a space where everyone can have fun. I’ve been trying to keep the girls busy this summer and I accidentally stumbled upon Josh’s Jungle while taking a music class at the library. It’s located at Town Center Park. It’s adjacent to the Miller Memorial Library and next to the town’s community garden. When you first walk into the park you are greeted by two giant-size giraffes that immediately grab everyone’s attention. Juliette and Olivia were amazed by the giant statues even though we had seen real life giraffes during our trip to Disney. 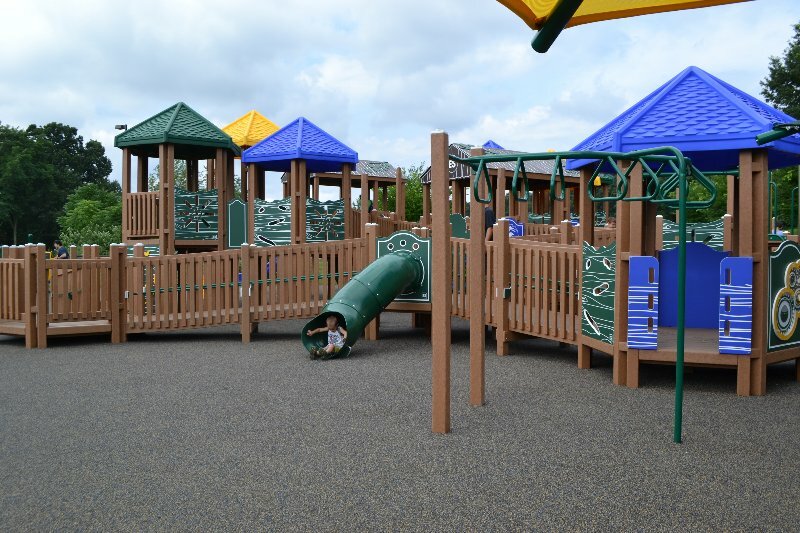 The playground features ramps that are handicap accessible. 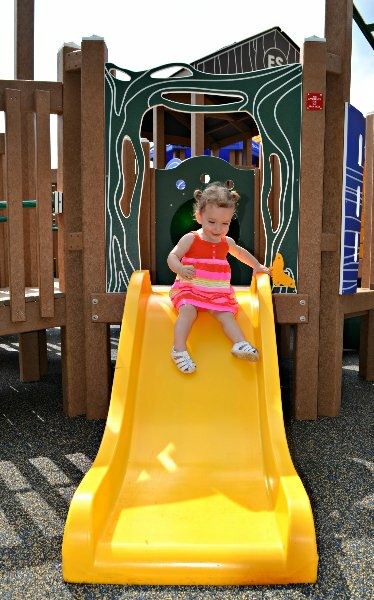 The ramps are also the perfect place for Jules and Livie to run and explore the park on their own. 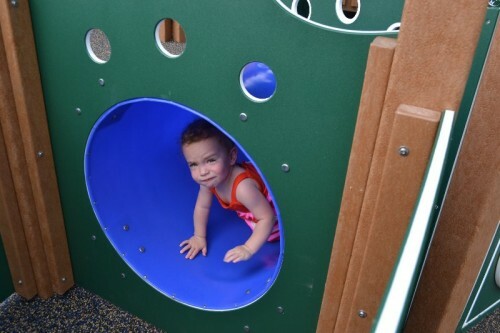 There are areas specifically designed for younger children 2-5 years old. 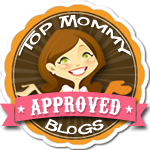 There are also more advanced sections for older children. This summer my girls have become more independent at the playground. 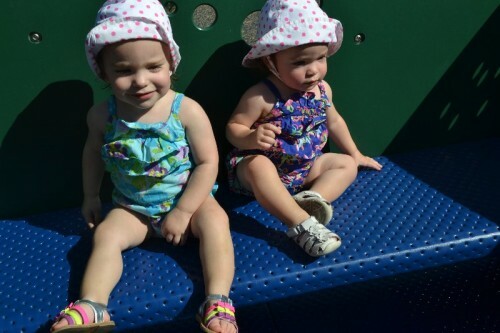 They love going down the slide all by themselves. It’s such a noticeable change from only a few months ago when they needed me to carry them everywhere. I don’t miss lugging a twenty pound baby around in each arm or having to bring the stroller everywhere. The tunnels were also a big hit. I think it’s because they love crawling through our tunnel at home. The girls had fun being rocked on the wheelchair accessible “Cruiser”. We enjoyed our time exploring Josh’s Jungle. 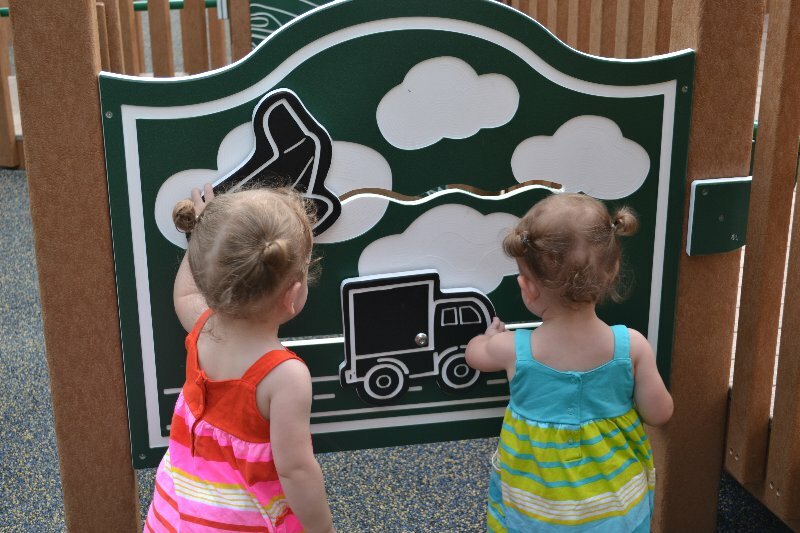 The new park will surely bring countless hours of fun for children of all abilities. The story behind the park is a great reminder of how one mother’s love and dedication for her child can change a community. Posted in Family Day Trips, Things to do in CT, Travel. Tagged Connecticut, hamden, park, playground.